Collateral are thrilled to release their debut EP ‘4 Shots!’ on Friday 23rd November via Roulette Records. The E.P. features the band’ new single ‘Midnight Queen’ plus three other tracks. Ever since Collateral burst on to the music scene earlier this year, they have attracted attention from venues, festivals, press, and of course, rock music lovers everywhere. Collateral fit neatly into the current NWOCR with their ‘Rock Anthems’ reminiscent of early Aerosmith, Bon Jovi, Little Angels, Thunder, Skid Row and Tyketto. This year they played Hard Rock Hell’s private VIP party and the reaction was off the hook. 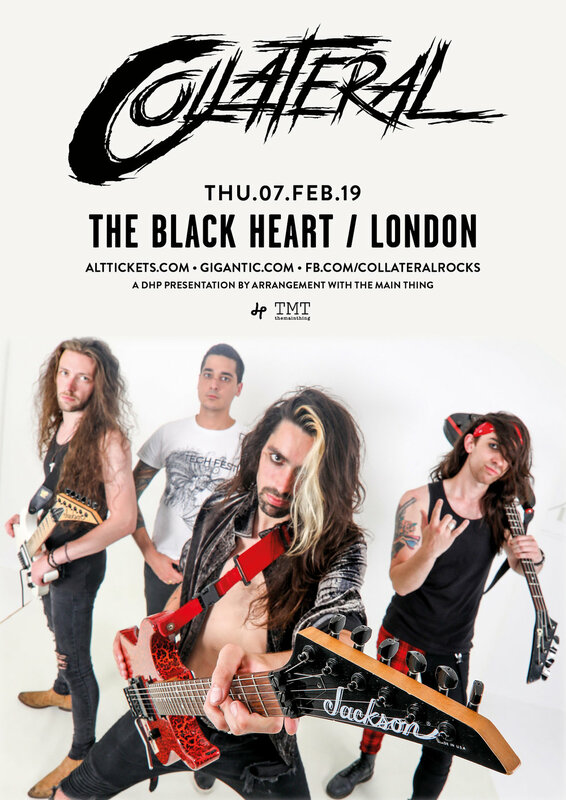 What sets Collateral apart from the rest of the new bands is their combination of electric and acoustic guitar set against a big drum sound and throbbing bass guitar. They are loud, rockin’ and melodic. You can’t take your eyes off them. Ripped jeans, cowboy boots, long hair and plenty of eye-liner, Collateral are a new generation stadium-driven rock’n’roll. When they first started out, they were known as the Angelo Tristan Band, with frontman Angelo and bass player Jack forming the nucleus of the band. Since then, almost 5 years ago, they have worked tirelessly to grow their music, fanbase and their profile. In true rock and roll style, it’s been a long ride, but their sheer grit and determination have seen them overcome obstacles and go from strength to strength. With the recent addition of new members Todd Winger (guitar) and Ben Atkinson (drums) and with the forthcoming release of their debut single 'Midnight Queen' and ‘4 Shots!’ E.P., the boys have stepped up their game and are now attracting the attention they deserve.